The bus will pick kids up on corners along primary bus routes. Buses also will pick up and drop off at childcare centers within the service area, for those who are attending before or after school childcare. Buses will not transport kids to before or after school activities. All enrolled families will receive a letter from SPS Transportation Services notifying you of your bus stop. If you have questions about-or changes to-your bus stop assignment, please email transdept@seattleschools.org or call 206-252-0900. There is a teacher on "bus duty" in the morning. Students get off the bus and go to the playground - not into the building. The playground is supervised from 7:40a-7:55am. The first bell rings at 7:55am - at that time teachers will line up their classes in the playground and enter the building together. The last/tardy bell rings at 8:00am at which time it's expected that all students are in their classrooms, ready to learn. Teachers will walk all students taking the bus to their school buses, all year long. Teachers and drivers have student lists. 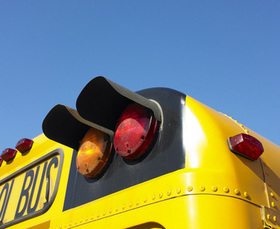 Teachers will make sure students are on the correct bus - and the drivers double check. Teachers will get every child to his or her appropriate pick up location after school: their school bus, Kids Co., or to the playground if they're being picked up. Teachers will not be able to meet with parents right after school for this reason. Buses all have other schedules to meet - but the bus won't leave without all its students. Bus drivers will make sure students get off at their bus stops. If your child is not taking the bus, check out our Pick-Up & Drop-Off Procedures page for more info. Transportation will only grant ONE am and ONE pm stop. This means you cannot get assigned to a bus to take your child to daycare some days, and home on other days.